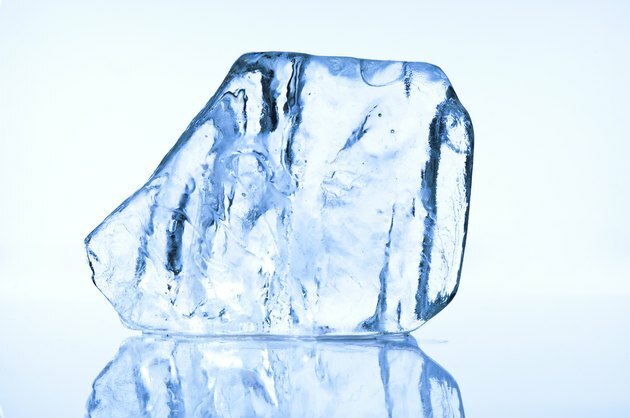 “Hot ice” refers to a popular chemical demonstration in which a solution of sodium acetate dissolved in water and placed in a freezer instantly solidifies when poured from its container or when a single crystal of solid sodium acetate is dropped into the solution. The solidification process releases heat and thus gives the appearance of the formation of hot ice. Chemistry instructors use this to demonstrate the phenomenon of supersaturation, or the ability of some solutions to contain more dissolved material than they normally should. In chemistry, the term “compound” refers to a material comprised of more than one chemical element. For example, table salt, also known as sodium chloride, contains sodium and chlorine atoms. When the compound contains both a metal and a nonmetal--as distinguished on the periodic table of the elements--chemists refer to the compound as “ionic.” Some ionic compounds dissolve in water, and during the dissolution process the positively charged metal, called a cation, separates from the negatively charged nonmetal, called an anion. The process of precipitation represents the opposite of this process; that is, the cation and anion combine to form solid crystals in the solution. Chemists describe the ability of a compound to dissolve in water as solubility. By definition, the compound present in lesser quantity represents the solute, and the compound present in greater quantity represents the solvent. In the case of a solid dissolving in a liquid, the liquid usually qualifies as the solvent. Generally, chemists state solubility in units, such as grams per liter, which means “grams of solute that will dissolve in 1 l of solvent,” or “grams per 100 ml.” Saturation occurs when the maximum amount of solute has dissolved in a given amount of solvent. Some compounds exhibit inherently higher solubility than others, but in all cases the solubility varies with temperature. Generally, the higher the temperature, the more solute will dissolve in a given amount of solvent. The process of oversaturating, or “supersaturating” solutions hinges on the manipulation of temperature. The phenomenon of supersaturation occurs when the amount of solute dissolved in a given amount of solvent exceeds the saturation point. Scientists do not fully understand the mechanism by which solutions become supersaturated. Precipitation requires the formation of a small solid crystallite in the solution, a process called “nucleation.” After the crystallite forms, a second process, known as growth, enlarges the crystallites to the macroscopic level such that they can be observed and isolated. But growth does not occur without nucleation, and some solutes under certain conditions resist this process. Nucleation tends to require a “rough” surface on which to initiate. The rough surface may be an impurity, such as dust particles, or a scratch on the inside of the glass container in which the solution resides. Alternatively, an experimenter can initiate nucleation deliberately by adding a single, small crystal of the compound being precipitated. Consequently, most instructions for the hot ice demonstration call for adding a few grains of solid sodium acetate to the supersaturated solution to induce crystallization. Sodium acetate is an ionic compound consisting of sodium cations, Na(+), and acetate ions, C2H3O2(-). Like most acetates, it exhibits high solubility in water: 76 g dissolves in 100 ml at 0 degrees C. The solubility, however, increases substantially at higher temperature. The hot ice demonstration calls for creating a saturated solution of sodium acetate in hot water, then placing the solution in a freezer. As the solution cools and approaches 0 degrees C, the concentration of sodium acetate will remain above 76 g per 100 ml, i.e., the solution will be supersaturated. The precipitation of a solid from a solution results in decrease in the disorder of the system. That is, in the solution the ions move freely in random directions and therefore exhibit high disorder. When the ions combine to form solid crystallites, their freedom of motion becomes restricted. Scientists describe this as a decrease in the entropy, or disorder, of the system. The laws of thermodynamics stipulate that for a process exhibiting a decrease in entropy to occur spontaneously, such as the precipitation of a solid from a solution, the process must also liberate heat. Consequently, the introduction of a solid crystallite of sodium acetate will warm itself as the sodium acetate precipitates from solution.